Need your daily fix of free apps? We’ve handpicked 48 iPhone, iPad and iPod touch apps that are free today only. 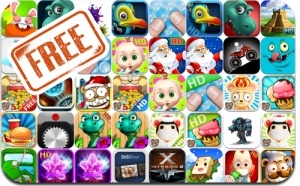 This apps gone free alert includes Mayan Puzzle, Pinch Peeps, Zombie Pirate Robot Attack, Hamburger Maker, Coin Push, Bear War Online, TapTap Alone, Bugs Smasher Online, Burger Cat, Turbo Grannies, X Invasion 2, and many others. Notepad – Files organizing, Easy typing!